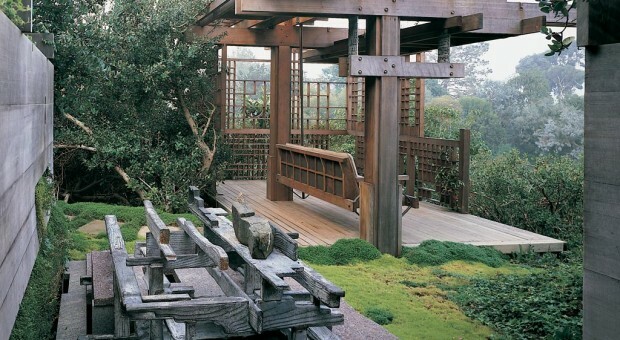 For a private residential site in La Jolla, California, Michael Singer was commissioned to design and construct a sculpture, pavilion, pathway and plantings. A pathway leads to the top of the hill where the shelter provides a place for viewing a stone and bronze sculpture and the ocean. The shelter walls are redwood trellises planted with vines. Transparent glass panels and planters form the roof. A swing bench hangs from brass straps attached to the beams. The site for the granite and bronze sculpture Ritual Series/ Map of Memory 1990 is cut into the hillside and retained by a redwood wall containing planter pockets. Mesquite trees grow along the pathway and around the pavilion.